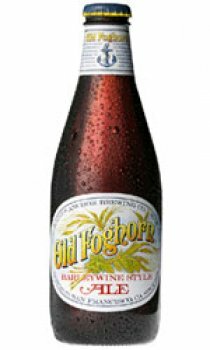 Perfect for sipping after dinner, Old Foghorn is highly hopped, using only Cascade hops. It is fermented with a true top-fermenting ale yeast. Carbonation is produced by an entirely natural process called "bunging," which produces champagne-like bubbles. Their "barleywine ale" is dry-hopped with additional Cascade hops while it ages in the cellars. Anchor have been producing small batches of Old Foghorn since 1975. Today, it is available both on draught and in twelve-ounce bottles. The high original gravity and full flavour of this ale make it a unique product, perfect for sipping after dinner.